Couple dedicates their lives to abandoned disabled dogs and is giving them wheelchairs! 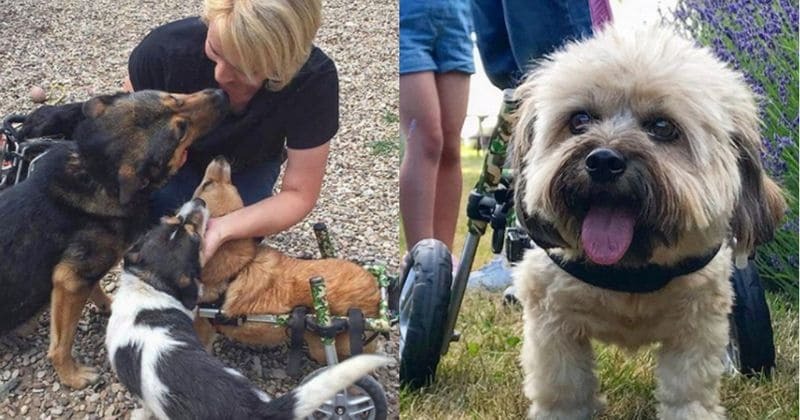 This wonderful couple from the UK take in disabled dogs and give them a second chance at life by providing them with wheelchairs. Cassie Carney and Tim Giles, a couple from Europe, are very good 'hoomans' and have dedicated their lives to disabled dogs who are abandoned by their owners and left to suffer, or worse, die. Cassie, a 40-year-old graphic designer, and her husband, Tim, a 50-year-old marketing executive, believe that it's sickening that humans abandon their disabled dogs. These unfortunate canines have every right to live and with a little care and love, they can go back to living their lives normally. This lovely couple absolutely LOVES dogs and despite their daily jobs, they're trying their best to improve the lives of all the disabled dogs around them. They provide these dogs with wheelchairs and all other medications and necessities these neglected dogs require. They run a charity called Broken Biscuits in their spare time where they take in abandoned dogs and take care of them. Several other organizations are helping this animal advocacy group to help dogs and look after their needs. "We’ve built up a network across Europe through working with various organizations. What tends to happen is an animal gets hit by a car and that dog gets brought into a shelter. We get contacted to help, whether it’s with their medical care or to help with the dog’s accommodation and ultimately find them foster care or a permanent home." Aside from the foster dogs the couple foster, they are also proud parents of a deaf Cavalier King Spaniel, a mixed breed amputee Yorkshire Terrier and Maltese cross, Otto who used a wheelchair and a three-legged cat. Broken Biscuits believes in giving a second chance to disabled dogs, rather than putting them down. "Our mission is to inform people that just because a dog’s had an accident doesn’t mean the only option is to put it down. There are options. It’s about informing vets as well," said Tim. After caring for these amazing pooches and making sure they're okay, the couple posts pictures of the dogs on their Instagram page and put them up for adoption and help them find families who'd love them unconditionally, their forever homes! You can donate to Broken Biscuits here.